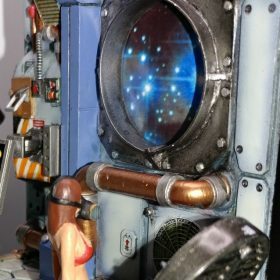 This scratch-built model is meant to portray a moment forever frozen in time: The engineer takes a quick break in the engine room and stares out of the spaceship’s window as it zips through the cosmos. This is an unreachable moment in our lifetime, and a never-ending moment in the spaceship’s fictional universe. 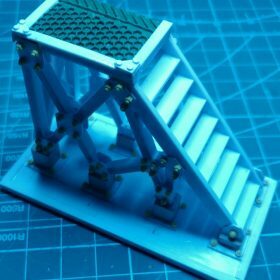 The staircase’s stairs were trimmed out of a Plastruct ladder model and then individual H-beams were used for the truss structure holding up the stairs. H beams were used specifically (vs. I beams) to enhance the look of the truss structure and most importantly to take advantage of their extra rib-depth when compared to I beams. This extra depth increases the bending stiffness of each individual beam in the entire truss structure, leading to a more robust design. 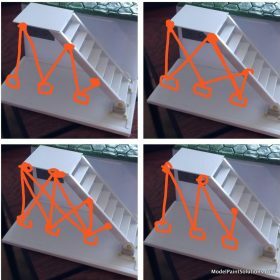 To create the shape of the truss structures, various truss models were drawn, and, in the end, the top right picture was selected as the winner due to both its structural integrity and also the aesthetics. 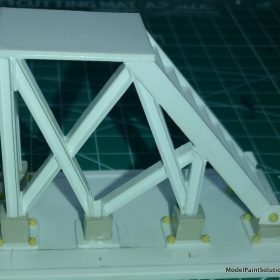 The H-beam angles & lengths were calculated trigonometrically, and beam-lengths were cut via trial-error method and welded together by Tamiya extra thin cement. 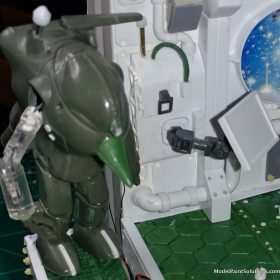 The Shaft-and-nuts were molded from GreenStuffWorld’s bolts-and-nuts silicone molds and the hex-bolt-heads were punched out using a hex puncher and styrene sheets. To translate the scale of the bolts, half-inch bolts were selected and properly scaled down (dimensions divided by 35) in order to have a better sense of the scale of the molded hex-bolts. 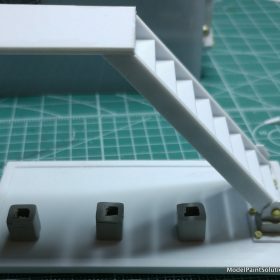 The top of the staircase’s flat panel was created using rollers from GreenStuffWorld and GreenStuff epoxy and reinforced with a 2mm sheet of styrene panel below it. The fan was completely scratch-built. I spent days looking for various propellers and fans online and in stores. I wanted a six-blade fan and finally I settled with for making my own (6 is a magical number in mechanical engineering world 😉). 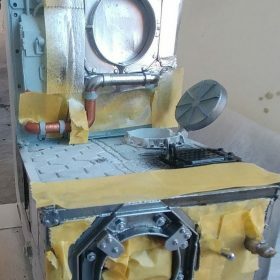 The picture here shows the basic build of the fan and the porthole and its cover, all scratch-built. The fan is operated by a planetary gear motor. Various poses and figures were used in the beginning to let imagination feed itself and for more ideas to flourish. I’m a big believer in having a general idea of what one wants to create and then as one continuously works on the model, the model almost creates itself since freedom in creativity will let the mind explore new shapes and ideas. 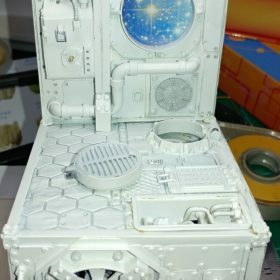 Styrene angle-irons were used to create the side-covers for the fan and bolts were added later to create the diesel-punk effect of an old spacecraft that needs constant maintenance. The Starwheel idea came about because I wanted to bring to life the idea of a spaceship in motion. The Starwheel has a 30-second period, meaning the pattern will loop every 30 seconds. The mechanism behind the wheel is a simple gear-motor, a timing belt and printed pattern of one of Hubble’s extraordinary pictures. 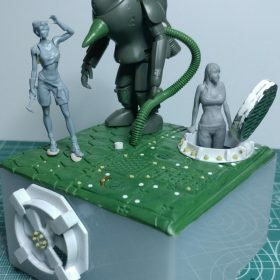 The covers and all various parts of the diorama are held together with N52 Neodymium magnets for ease of disassembly and maintenance. The Starwheel’s pattern is fully replacable. 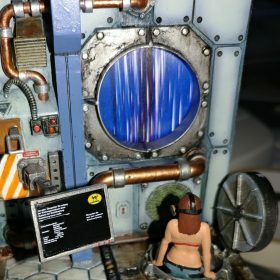 Here you can see that I even played with the idea of having a warp-wheel which I might incorporate in a future diorama. The engineering behind the Starwheel to make It run smoothly for hours (life-tested for 15 continuous hours without a glitch) proved difficult since connecting the pattern to the timing belt required a bit more thinking that I had planned for at first :). 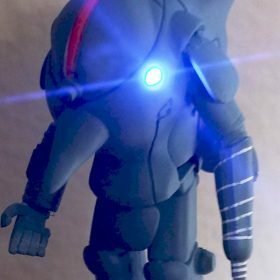 There are two SMD LEDs inside the Mecha. One can be seen in its right arm and another is inside its left eye. Getting the LED inside the right arm was a challenge. It required drilling holes at various angles and feeding in the LED. Later on, I thought I should have used a Fiber Optic in case the LEDs burn out…but oh well. Model kits are never really “finished”, they are only finally let go. 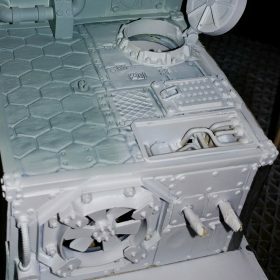 Here are some painting and masking pictures as I made progress week after week. I didn’t have much time between working full time and finishing graduate school, but for my first diorama, I’m happy how it turned out. Tamiya extra thin cement was used for joining all the styrene parts of the model together. CA glue used on styrene creates a brittle connection joint that I wanted to avoid. 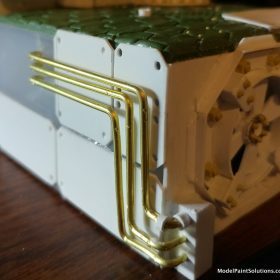 Tamiya’s thinner welds the styrene parts together by practically melting them hence we can rely on the overall plasticity of styrene afterwards. The Greenstuff parts were glued to the base by gorilla glue. If you have questions about this build Janan can be reached at JananKungFu@Gmail.com.